Bethlehem is first mentioned in conjunction with the death of the matriarch Rachel. Ruth and Boaz met at Bethlehem, married and bore their son Obed, the father of Jesse who in turn was the father of King David. God sends the prophet Samuel to Bethlehem to find the new king. Bethlehem is the hometown of King David. While fighting the Philistines, who had a garrison in Bethlehem, a thirsty David wishes out loud for some water. Micah prophesies God's promised ruler over Israel (Messiah) will be born in Bethlehem. But apart from the Bible, there hasn't been any archeological evidence of Bethlehem of the Old Testament found until recently. 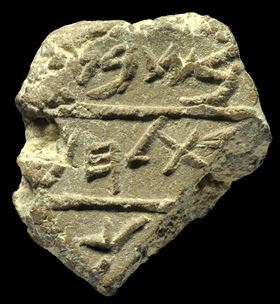 On May 23, 2012, the Israel Antiquities Authority announced the discovery of a clay seal bearing the name "Bethlehem" in ancient Hebrew script. Measuring only 1.5 cm (0.59 inches) long, the small bullae was unearthed just outside Jerusalem's Old City. The seal was written in ancient Hebrew script from the First Temple Period, and pottery found nearby also dated back to the same time. This placed the bullae during the first Jewish Temple period, between the eighth and seventh century B.C., at a time when Jewish kings reigned over the ancient kingdom of Judah and 700 years before Jesus was born. It is believed that the bulla was used to seal tax shipments of silver or agricultural produce exported from Bethlehem to the King of Judah, either Hezekiah, Manasseh or Josiah, in Jerusalem. Shmuel Achituy, an expert in ancient scripts at Israel's Ben-Gurion University said that the discovery is the oldest reference to Bethlehem ever found outside of the Bible. There are only some 40 other existing seals of this kind from the First Temple Period making this a significant find, both because such seals are rare, and because this is the first to mention Bethlehem. The ancient seal provides evidence that Bethlehem existed at least 700 years before Jesus and was indeed a city in the kingdom of Judah. 1. Dulle J, "Archaeologists Uncover first extra-biblical reference to Bethlehem" from the website Theo-sophical Ruminations, May 2012. 2. "2,700 Year Old Clay Fragment From Bethlehem Found in Jerusalem" from the website JewishVirtualLibrary.org, May 2012.